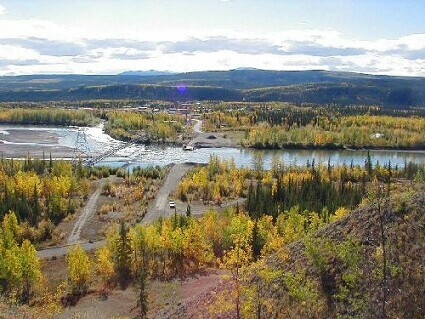 Located in the central Yukon, about 420-km northwest of Whitehorse, Ross River is a community of about 400 people who are largely from the Kaska First Nation. Ross River is about a four-hour drive in good weather conditions from the Territorial capital of Whitehorse which has a current population of 25,000 and can provide for most amenities. The community is located along the south bank of the Pelly River within the Tintina Trench. The community was named for a river by the Hudson Bay Company explorer Robert Campbell in 1834. Ross River gained its first road access in the early 1940’s when the American Army built the Canol Pipeline from Norman Wells, Northwest Territories, to Whitehorse. 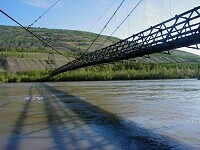 Ross River has the longest suspension footbridge in the Yukon. This historic World War II wood and cable suspension footbridge is over 600 feet long and the only contact with the other shore after ferry hours or seasonal. The fishing and hunting venues are extraordinary. Other facilities include many areas for walking, biking, snowboarding, snowmobiling, rock climbing, camping and just about any outdoor activity a resident/visitor wishes to pursue. The community currently has two stores, the Dena General Store and the Ross River Service Center. The Ross River Service Center supplies gasoline, diesel and propane. Ross River has one hotel, the Welcome Inn. There is one bed and breakfast located at Jack Fish Lake, about a 20-minute drive from Ross River on the South Campbell. We have many small business ranging from contracting to welding. There is a new Elementary school that has grades K-10; the students are then placed in either Faro or Whitehorse to finish their grade 12. There are a number of Government facilities such as Northern Affairs (Forestry), R.C.M.P. (three-person detachment), Nursing Station ( with doctor visits one or twice a month), Grader Station, Public Library, Yukon Government Health/Social Services (two-person post), Yukon Housing Corporation. Ross River has many volunteer groups such as the Volunteer Fire Department, Search & Rescue, Emergency Measures Organization, Sportsman Association, School Council, Library Board, Inter-Agency Committee and Canadian Rangers, to mention just a few organizations. There is a Yukon Territorial Grader Station that maintain the roads year round and operates the Ferry that runs across the Pelly River from approximately the May 24th long weekend till the end of September. A small single vehicle ferry allows access to the start of the North Canol Road. This narrow gravel road that runs about 250 km to the Northwest Territory boarder at MacMillian Pass in the Selwyn Mountains. MacMillian Pass is about 40 km south of Keale Peaks (2975M), the highest peak in the Selwyn Mountains. The Community is rich in culture and tradition. We celebrate an annual “Culture Exchange” at Coffee Lake approximately a 25 - minute drive from the community. This weeklong celebration attracts people across Canada and Alaska, many coming to perform and others to observe. The traditional knowledge, culture and art are shared with everyone that attends.